YouTube was the undisputed king online for online video but it is now facing a tough challenge from other platforms such as Facebook. Facebook is introducing new tools for video and is making great efforts to gain market share. It is true that people consume more video content using YouTube, but brands must now make Facebook also a part of their digital marketing strategy as it is receiving few billion video views every day. 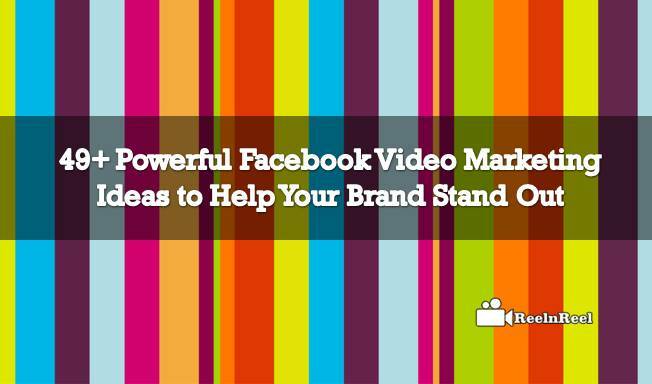 Here are few ideas for brands to use Facebook for video marketing. 1. Do not share YouTube videos but upload directly to Facebook. Such videos autoplay and attract more viewers. 2. There is no need for Facebook users to go to another place to watch video videos and this also increases engagement. 3. Don’t link the videos that are already on other platforms such as Vimeo or YouTube. Upload them directly to Facebook. 4. Repurpose the existing content for Facebook by remembering that viewing time on Facebook is shorter. 5. Read popular previous blog post over images and make a video with it over images. This is one way of repurposing the existing content. 6. Make videos that grab the attention of the audience in the first three seconds. 7. A boring beginning, the audience will simply scroll past. 8. Facebook also lets adding the call to action button and others. Use them in your video. 9. Make the thumbnail of the video eye-catching. 10. Upload a custom thumbnail for more benefits. 11. Tag other related people with your video to increase organic reach. 12. Embed the Facebook video on your blog or website to increase visitors to the Facebook page. 13. Posting video on the Facebook page makes interaction with visitors simple. 14. The video will be shared easily on Facebook. 15. Make the video a Facebook video ad to get more response. 16. A Facebook video ad will be shown to new groups of targeted viewers by Facebook. 17. Make the video informative and entertaining to increase shares. 18. How to videos proved to become a sure hit. 20. Shorter videos work better on Facebook. Facebook provides the metrics to understand what ideal length of the video is for your audience. 21. Boost your page by adding a feature video to it. 22. Organize your videos into the playlist. 23. Organize them by type, date and topic to help the audience find them easily. 24. Maximum video length on Facebook is 45 minutes and the optimal length is 1.3 minutes. 25. Recommendation of Facebook is to focus on content but not in length. 26. Keep the videos to the point. 27. If the video is longer, break it into short episodes. 28. Facebook video analytics showed what is working best. 29. How to videos are better to get engagement. 30. Entertaining videos also get the attention of viewers. 31. Behind the scenes, videos are another sure to hit type of videos on Facebook. 32. Show how your new product works and inspire consumers to buy them. 33. Customer testimonial videos also influence the buying decision of consumers. 34. For incredible results invest in quality production. 35. Do not neglect the audio quality. 36. Shoot mobile videos vertically as these look better on smartphones. 37. Deliver the message in the first few seconds of the video. 38. Do not dramatize the introduction but get to the point quickly. 39. Write a post with questions and tell that that the video has the answers. 40. Write the post to inspire curiosity to watch it. 41. Pay to promote the video on Facebook. 42. Let your videos communicate values to emotionally connect with Facebook viewers. 43. Facebook helps to stay connected with the people. Respond to the comments of your prospective customers on Facebook. 44. Choose unique styles for your video ad depending on what you want to get from the videos. 45. Branding videos will help to introduce to the followers. 46. Add an element of humor in your video ads and people will identify with it. 47. Funny videos are also shared more so dedicate only a small part of the video to promote your brand. 48. Another type of popular video ads is the educational type of videos. 49. Create video especially to target people who already visited your site. 50. User generated content also help to grab attention.